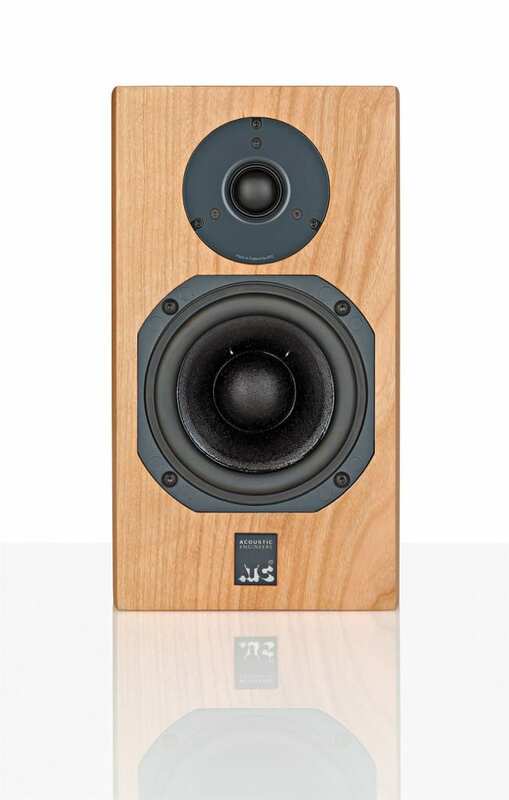 The ATC SCM7 is a diminutive loudspeaker of just 7 litres and costing from £810. Dan Worth takes a listen. On different occasions over this past year Dominic and I have had the pleasure of listening to the SCM11s and the SCM19s from British loudspeaker company ATC. Each time we’d greeted their arrival with a mixture of apprehension and excitement. This is because our experience of ATC had taught us to expect great dynamics, attack, insight and truthfulness, but also the occasional jagged edge from the older style tweeter, particularly on poorer quality recordings. However we needn’t have worried. For their new ‘passive’ range ATC has replaced a modified third party tweeter with its own in-house design – and it’s stunning. The unit on these new SCM7s, and the 11s, 19s and 40s is at once more refined, better controlled and truthful. Its secret is a dual suspension design, which is hand-built at ATC’s Stroud HQ and has taken the Company years to perfect. Coupled to a more efficient and linear underhung driver motor, the dual suspension controls the driver’s movement more precisely for lower distortion, better power transfer and a smoother response. ATC has got this design just right, because both the 11s and 19s have received our highest accolades. 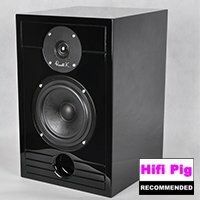 The dinky SCM7s have a tiny 7-litre cabinet (hence the name), measuring 300x174x215mm and housing the tweeter and a 5″ linear mid/bass driver. The review sample’s curved design immediately felt solid and sturdy, with a high standard finish in real cherry wood veneer. They cost £810 a pair in the standard cherry or black ash options. However a special order piano black model comes in at a hefty £1243. I was pleasantly surprised when I lifted the SCM7 from its box. It’s much heavier than I had imagined weighing-in at around the 7.4kg mark. Nearly half of this weight is due to the bass/mid driver’s massive 3.5kg underhung magnet system, which includes a 45mm flat wire voice coil, milled by ATC at Stroud on a machine designed by ATC’s founder and Chief Engineer Billy Woodman. Most of remaining weight is down to the heavily-braced veneered enclosure, which also sports chunky bi-wire terminals. Dom and I have had many conversations about the character and virtues of the SCM11s and 19s. We’ve decided that the 11s are about pure excitement and have a punchier sound whereas the 19s come across as richer, fuller and more refined. I’m writing this before Dom has had a chance to listen to the SCM7s, so I’ll give you my immediate impression: these 7s are really exciting and their imaging is fantastic. 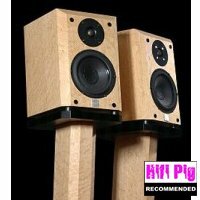 Due to their size, they struggle to reproduce image height if you are sitting too close to them, but when you’re sat back and even at lower volumes, they get going so easily for an 84db-sensitive speaker, instantly disappearing into the background and placing instruments way beyond the expected width boundary. I would suggest that they have some of the SCM11’s zip and enthusiasm, which Dom and I loved so much. They punch rather than pound, but the bass is so representative of truthful playback (given their 60Hz limit at -6dB), that I only hankered for more on occasions. Obviously the 7s are ideal for those who have limited listening space, but I would suggest they’re also great for music lovers who enjoy vocals and acoustic guitar, as well as pop and electronic music – I would prefer a bass reflex design in this sized cabinet for the latter. The SCM7s can’t muster the wash of deep bass you’ll get from larger cabinets and drivers, for example on bass guitars and oboes, but they will keep a beat. Sparkling percussion sounds terrifically accurate from these small boxes, complete with all their natural dynamics. 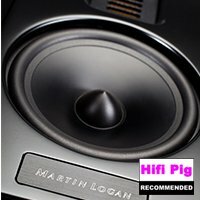 When replacing my active desktop Focals, I was extremely impressed with the 7’s overall response, especially from the bass when enhanced by the alcove they were sitting in. What I really enjoy about the 7s and even the 11s is that they seem to allow upper frequencies to breathe so well, allowing for more perceived accuracy in the higher frequencies and mid level notes, making for a crystal clear vocal reproduction. I suspect this is due to their tonal balance from smaller cabinet sizes and sharper bass roll off, but it got me thinking that a set of 11s or 7s with ATC’s own C1 subwoofer could make for a stunning listen. Fast forward a few days and, courtesy of ATC’s PR man, I now have a C1 subwoofer and I’ve put together a little system comprising SCM7s, C1 sub, and a Primare I32 with MM30 multimedia board/DAC fed by my Mac. Wow, this set-up proved to be a real treat. I suspect that ATC would frown upon the idea of passive speakers and active sub in a music application, because it wouldn’t be the last word in accuracy, but what the hell, this system rocked with everything I sent it. I love the increased definition of the midrange especially, under-pinned with tremendous weight, poise and control. Even the treble sounds beefier. Dialing the sub in to around 60Hz to integrate with the 7s was magic. Not purist, but magic – and fun! Dance music had a more intense rhythm and a crystal clear top end. Rock had a grip and a leading-edge sharpness that may well have sounded overbearing from the 7s alone, but with the C1 it had more flesh on the bone and greater weight. Acoustic music and vocals seemed to be better defined in the soundstage with an in-filling of subtle undertones that demanded the attention of the listener. It just sounded richer. In each scenario the 7s worked so well. 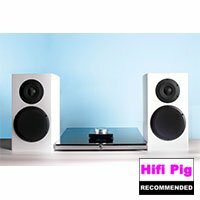 Ultimately available space and music tastes will determine your speaker choice, but if you have room for a subwoofer I would wholeheartedly recommend one from ATC, as it adds another dimension to the sound. I’ve not written a long review for a change. This one is short and sweet – just like the 7s. Combine the imaging of the old ProacTablettes, the surprising bass of a Totem One and the enthusiasm of an old AE1. 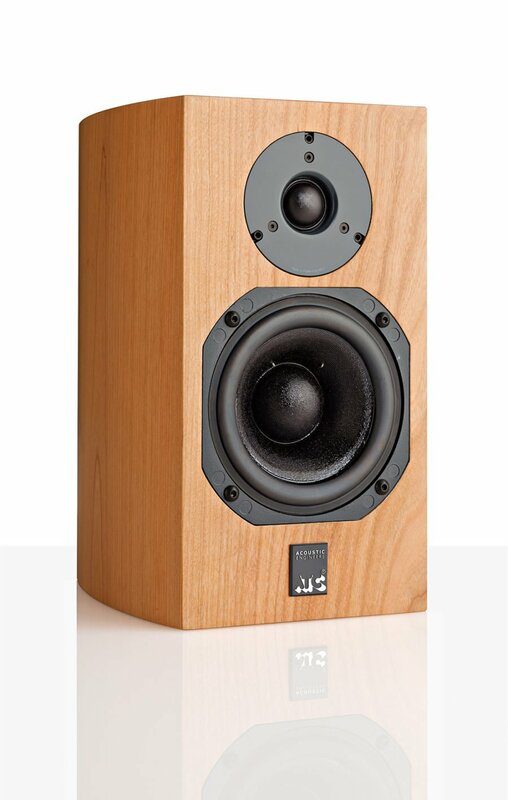 Each of these speakers is renowned for having a special and memorable characteristic. The diminutive ATC SCM7 seems to possess a good measure of each. It’s one of those speakers that is so addictive and so unassuming that I think I’m going to have to buy a pair. They are like the cutest animal in the litter – the one you simply have to take home. Over time their musical consistency, honesty and downright practicality are simply undeniable. The thought of being without them has me reaching for a tissue. 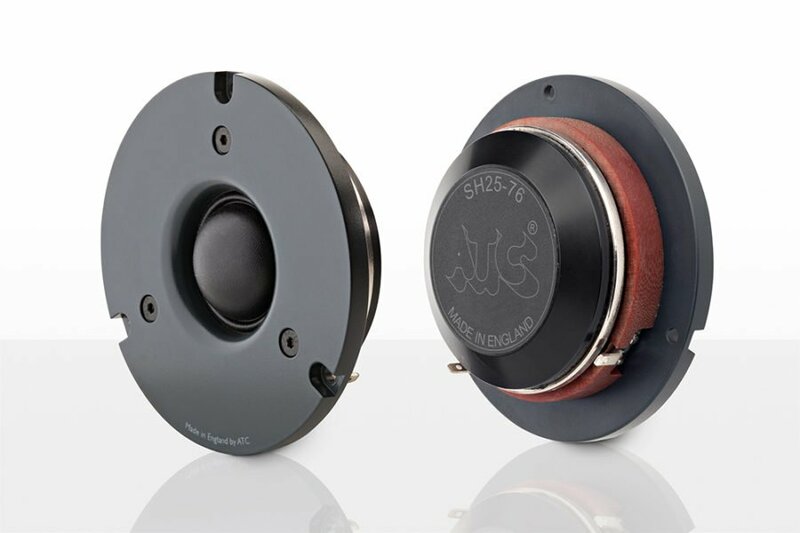 The SH25-76 is a 25mm soft dome tweeter designed and built by ATC Loudspeaker Technology and exclusively employed on ATC’s SCM7, 11, 19 and 40 ‘passive series’ speakers. The drive unit has been designed with the same no compromise philosophy as all other ATC drive units. Sharing technology with the SM75-150 mid-range, the SH25-76 employs a dual suspension design, ensuring pistonic motion and suppressing rocking modes even at high drive levels. This also enables the use of a narrow magnetic gap and negates the requirement for ferrofluid. The SH25-76 is therefore, free from the detrimental effects of ferrofluid drying out over time. 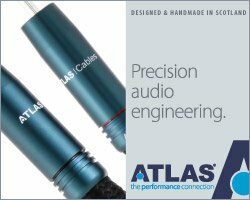 A short coil, long gap configuration ensures linearity and incredibly low distortion through its intended operating band. 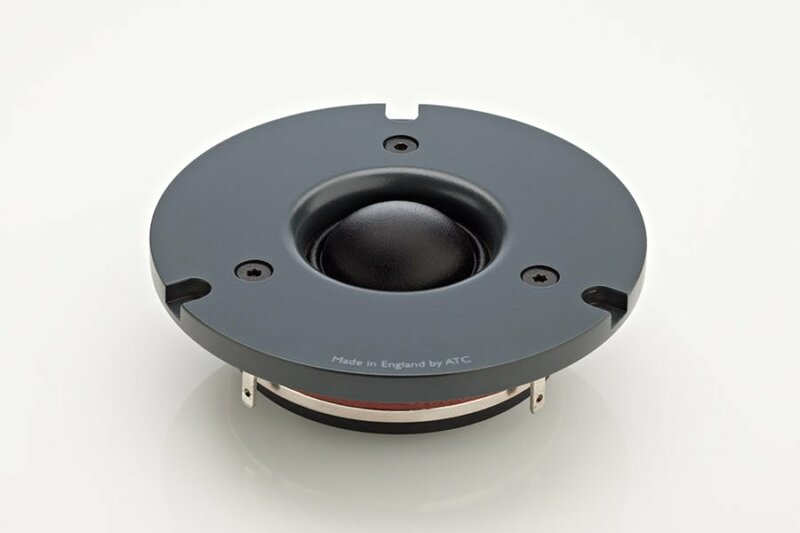 The soft dome diaphragm is based on a complex geometry which maximises power transfer from the former, extending the high frequency response and giving a smooth off-axis response. The FEA optimised neodymium motor with heat treated top plate is designed to give 15,000 Gauss (1.5 Tesla) in the magnetic gap and the motor assembly also performs the secondary function of dissipating heat away from the voice coil, ensuring high power handling and low power compression. The underhung design, small coil-gap clearance and black plating ensures heat dissipation is as efficient as possible. The geometry of the waveguide is designed for optimum dispersion and the flattest possible on-axis frequency response. It is made from a precision machined alloy so that the entire structure is extremely rigid and free from resonances. Less variation in the force acting on the coil vs excursion. Less variation in coil inductance vs excursion. The result is that distortion is greatly reduced. The music benefits from greater clarity and tonal balance and the listener benefits from reduced listening fatigue. Increase of the system low frequency ‘Q’ (causing a tendency for pronounced ‘boomy’ bass). Modification of the crossover performance which, in turn, changes the perceived balance of the loudspeaker. Using the largest possible voice coil diameter increases the coil surface area which reduces the rate of voice coil heating and minimises the problems associated with it. Not only is great attention paid to the coil but also to the wire we wind the coil from. Round wire does not ‘pack’ (tessellate) well, leaving gaps between the windings (think pool balls racked before a break). These gaps are wasted space and fill with glue and air, slowing the escape of heat from the coil. ATC chooses to use the more complex and costly process of winding flat ‘ribbon’ wire voice coils. The ribbon wire, when wound on edge, results in a greater volume of copper in the magnetic gap (vs round wire) and the efficiency of the drive mechanism is improved. The air and glue filled gaps are also greatly reduced, leading to a more rapid escape of heat from the voice coil. The cone and dust cap of the bass driver used in the SCM7 are formed into curve-linear profiles from resin impregnated fabric. The fabric chosen uses a very strong and dense weave, with high internal damping. Two different polymer coatings are then applied to the fabric surface: a PVA based coating to the rear and a proprietary coating to the front. Both of these coatings increase cone stiffness and also, very importantly, the mechanical damping of the cone structure. Materials high in damping suppress resonances, minimising the audibility of cone break up modes and extending the useable bandwidth at the top of the bass driver’s range. This in turn greatly simplifies crossover design (which I’ll get to shortly). ATC believes that as a loudspeaker manufacturer, you are defined by your drive unit components and that is why every loudspeaker system we produce begins with in-house designed and built components, optimised for their application. By investing heavily in the drive unit engineering, ATC produces components with a well-controlled response that require only simple filters to integrate into multi-driver systems. The SCM7 employs 2nd order filters for both the low-pass and high-pass sections. The bass section also uses a R-C zobel network to correct for the rising bass driver impedance, ensuring correct operation of the bass low pass filter. The high frequency section uses a resistive ‘T’ attenuation network to pad the tweeter output down to match the bass. All of the inductors used are air-cored types for lowest distortion and the capacitors are 250Vdc rated metallised polypropylene parts. An area of the crossover design we pay particular attention to is that of impedance vs frequency and ensuring the loudspeaker system (drivers + crossover + wiring) present an easy load for an amplifier to drive. The loudspeaker load an amplifier ‘sees’ is just as important as the sensitivity of the loudspeaker, although loudspeaker load doesn’t seem to be debated quite so regularly. Not only must the magnitude of the impedance be balanced with a reasonable system sensitivity, the phase angle must also be considered. Low impedance values or large phase angles will lead to large current demands from an amplifier and could lead to increased distortion and, at worst, amplifier hard clipping. The combination of both a low impedance magnitude and large phase angle is very difficult for an amplifier, especially when it occurs at a frequency where music has a great deal of energy. Through careful drive unit design which, in turn, allows simple crossover design, free from ‘ringing’ filters that are used to reinforce a frequency band lacking in energy, we can deliver a loudspeaker that presents an easy load to an amplifier.